Three refugees seeking shade from the midday sun in the Syriac Catholic church Mart Shmony in Ankawa, Erbil. Schools, parks and construction sites are being used as temporary homes by thousands of families fleeing ISIL in Northern Iraq. Text by John Paul Kuriakuz – former executive director of the Chaldean Assyrian Syriac Council of America. “Before the U.S.-led invasion of Iraq in 2003, an estimated 1.4 million Chaldeans and Assyrians inhabited Iraq. 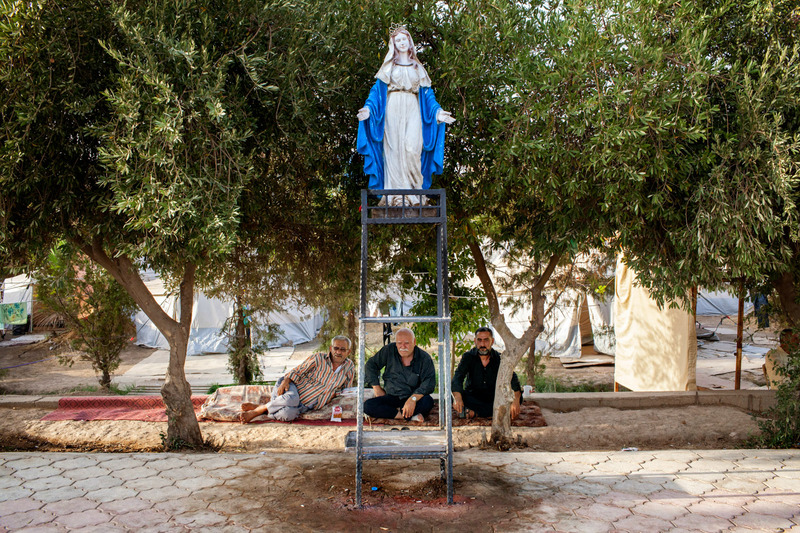 In the decade that followed, hundreds of thousands of these Iraqi Christians either sought permanent refuge abroad or were internally displaced. During this turmoil, more than 60 churches were bombed, a Chaldean Catholic Archbishop was kidnapped and murdered, and an Iraqi Christian population of 1.4 million dwindled to fewer than 500,000—a result of the insurgency, subsequent unrest, and radically anti-Christian sentiment that ensued. Today, targeted by ISIS for their Christian faith, Chaldeans and Assyrians are the victims of an unabashed ethnic-cleansing campaign. After seizing the northern city of Mosul in June, ISIS spray-painted the symbol for “Nazarene” on the homes of Christians. Families had 24 hours to convert to Islam, leave the city or face execution. Christians leaving the city had their possessions confiscated at security checkpoints and were forced to leave with nothing. Ryah Achram Abbit is 20 years old and seven months pregnant with her second child. She fled Mosul one and a half month ago after ISIL had taken the city. As they reached the Isil checkpoint on the outskirts of the city, they were stopped by armed jihadis who took everything, they had. After Ryah’s earrings were pulled off her ears they were told to leave the city. A displaced family is temporarily moving in to a half finished housing complex on the outskirts of Erbil. Around 700 families lives in the churchyard of Mar Elia in the Christian neighbourhood Ankawa.